Debuting at Laser Mayhem, our new low-impact Mini-Paintball experience! Exclusively for ages 8 - 13 years, ideal for birthdays and social gatherings! Using the latest and greatest in Paintball marker, bring Call of Duty to life across a circuit of outstanding playing fields featuring real-life Russian battle-tanks, crashed aircraft and fortresses. 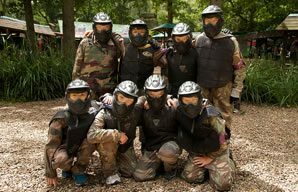 Low-Impact Mini-Paintball for only £27 per person. 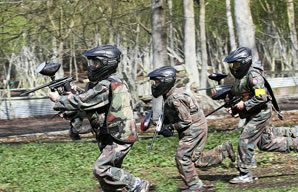 Kids love our Mini-Paintballing sessions! Wielding light-weight guns and firing a smaller type of Paintball, its all the fun but without all the pain! We will also provide fitted, durable body armor, reinforced gloves and full-head goggles with our package. To top it all off you'll also be provided with a private space, in our fully-heated indoor party room, for your little soldiers to unwind at after an of long days battle. You will have your private space ready and waiting for you upon arrival, so while the kids are out playing the parents can get some much-needed rest and relaxation. Food can also be provided at an additional cost, however, you're more than welcome to serve your own food at our facilities. Our action-packed sessions entail two hours of Paintballing, playing an average of 5-7 games in that time. All ammunition is included in the package and will be distributed and reloaded, pregame, by our team of dedicated marshals. There will be no need to purchase additional ammo on the day. Sessions run at two standardized time slots of 10.30am-12:30pm and 1pm-3pm, Monday-Sunday. Additional slots may be provided, subject to demand. Mini-Paintball has all the fun and adrenaline of the traditional forms of Paintball, that we've all come to know and love, while firing a smaller caliber of ball (.50cal) at a lower velocity (245fps). This coupled with all the protective equipment provided by us will completely limit the contact on the player, making it far less painful from what you may have experienced in the past. 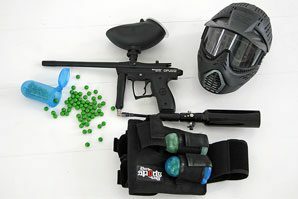 What's included in our Mini-Paintball Party Package? Heated Party room with private table space and seating to accommodate your group size. Between 400-500 Paintballs per combatant. 6 brand new, purpose-built, playing fields. Featuring all the same themes and military hardware you come to expect from us here at Mayhem, just condensed into a more manageable size for the children. Full instruction and supervision, for all children, provided from our Marshalling team. Orange squash/tea will be provided free of charge for participants and non-combatants alike. Other beverages can be provided at an additional cost. All participants will be given an exclusive Mayhem mug as a memento of their time here with us. Party invitations can be provided, free of charge, to all participants upon request. Please inquire at the point of booking for further details. Anything you don't mind getting a little messy, even though full body camouflage overalls are provided and we use the finest in water-soluable Paint, there is still the potential of getting dirty. Parents please be advised, at least one parent/guardian will be required to attend during the session. All disclaimers/release forms will need to be filled and signed by a person over the age of 18 before the participant is permitted to the field. 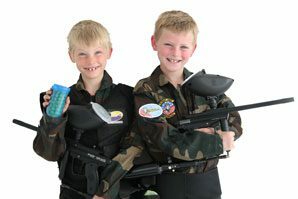 Mini-Paintball is an activity offered exclusively for ages 8-13, any person/persons not adhering to those age restrictions will not be permitted to the field. No spectator area is provided on field due to Health and Safety concerns.